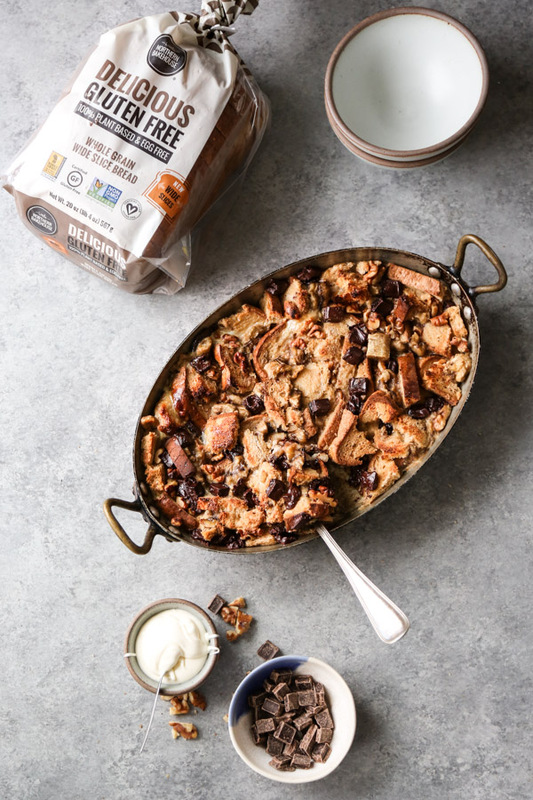 This banana bread pudding recipe is brought to you in partnership with my friends Little Northern Bakehouse. As always opinions are 100 percent my own. 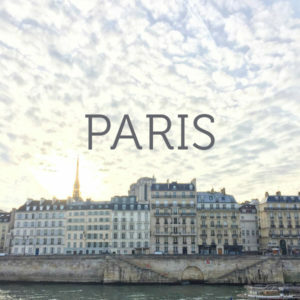 Thank you for supporting the brands that make this site and all my gluten-free desserts possible! Romance is many things, especially in married life. Sometimes it’s a foot rub. Others it’s a home cooked meal or hidden note. 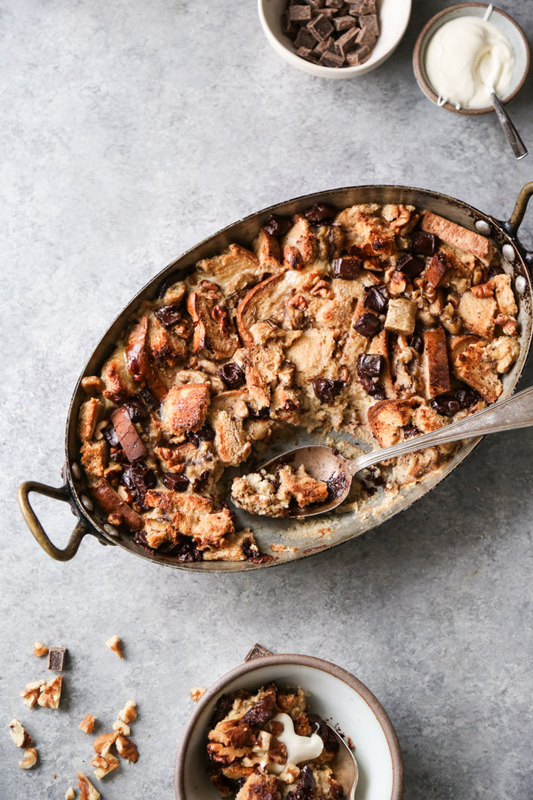 And on a particular night last week, it was cleaning a congealed banana bread pudding pan that had been sitting in the sink for two days…even though you were not allowed to eat it. That’s my husband for you, folks. He’s a hero. Unfortunately, for the month of January, per his doctor’s orders, he’s also a hero who is trying to not eat carbs. Before this dietary update, I was brainstorming delicious, semi-decadent desserts to make for Valentine’s Day. One of Charlie’s favorite treats of all time is banana bread pudding. 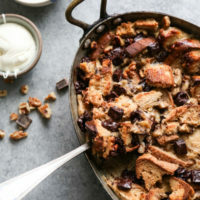 But since I already have a healthy, gluten-free version of that on the site from Valentine’s Days past, I thought I would do a riff on it with the loaf of Little Northern Bakehouse bread I had hanging out in the fridge and make a chunky monkey bread pudding. 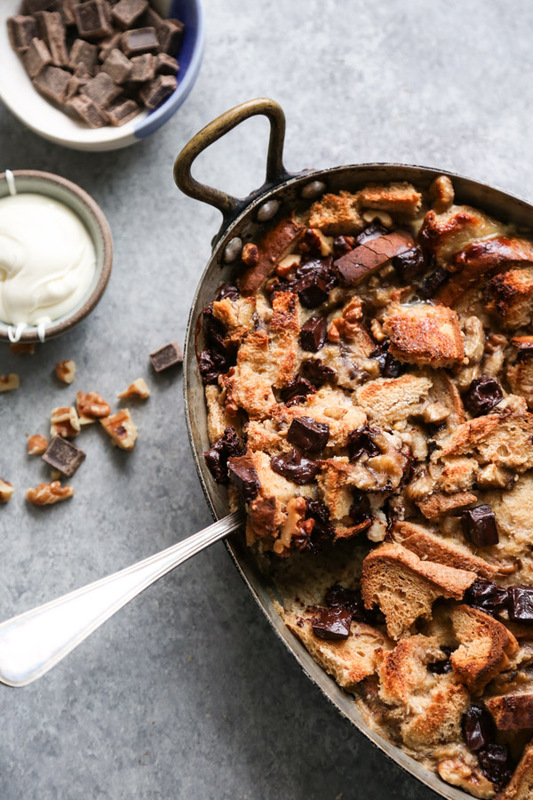 This banana bread pudding doesn’t use actual banana bread, though I’m sure that would also be ridiculously delicious. Since I’m not much of a baker, I don’t like to start my desserts with something I have to first bake from scratch and then remake into something else. 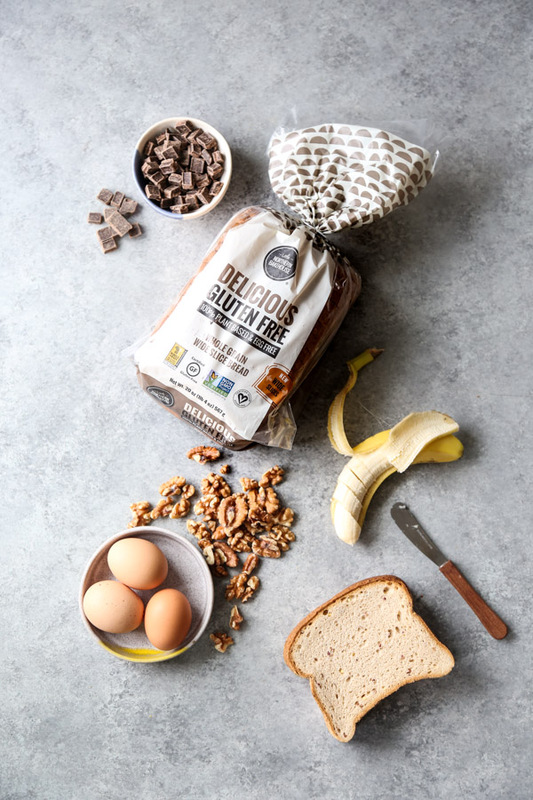 Instead, I’d rather take something that used to be delicious (this loaf of bread that is now semi-stale) and repurpose it into something that transcends its former self thanks to the addition of a banana custard, chocolate chunks and walnuts. Just like I love fried rice as a means of using up old rice, bread pudding is the perfect way to get rid of all the odds and ends from old loaves of bread that have been hanging out in the fridge for months. The process of making this recipe was also a great Marie Kondo-ing of my fridge. I used the last few slices of Little Northern Bakehouse Millet & Chia loaf, and then a few from a slightly newer package of Little Northern Bakehouse’s Wide Slice loaf, which I love for makingthisandthis. Both are gluten-free, plant-based breads with a light and airy texture – perfect for this dessert. 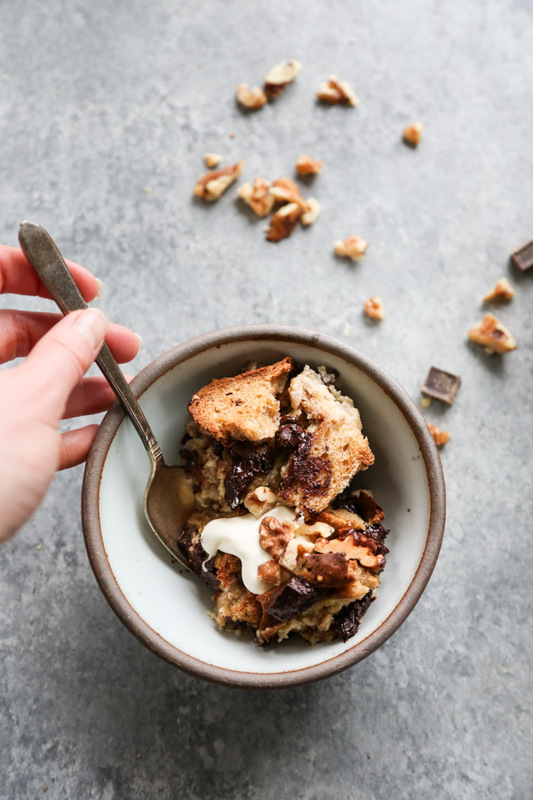 The bread pudding turned out incredibly creamy, despite being dairy-free, perfectly sweet, even though it just relies on banana and a hint of maple syrup, and just chocolatey enough. Meaning, very. 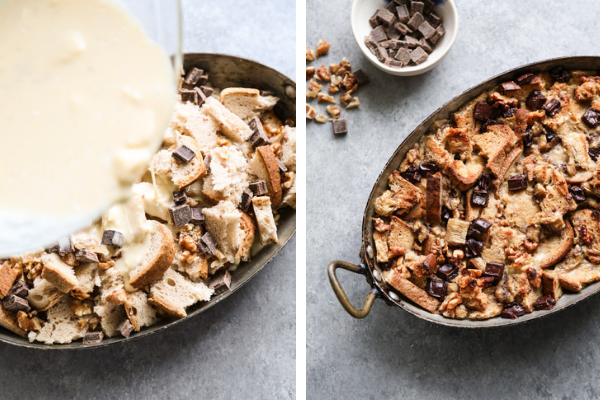 The only downside to this chunky monkey banana pudding is that if you don’t manage to find a partner to help you lick the pan clean, well, you might want to at least find a partner who will clean it for you. Wishing you all a very sweet holiday of love. And if you aren’t attached this year, consider making a friend that home cooked meal or leaving her that hidden note. I know my fondest memories of Valentine’s Day is not with lovers, but friends. Because after all, our friendships are truly what makes the world go round, and you don’t need any excuse or holiday to share a little gluten-free banana pudding with someone special. 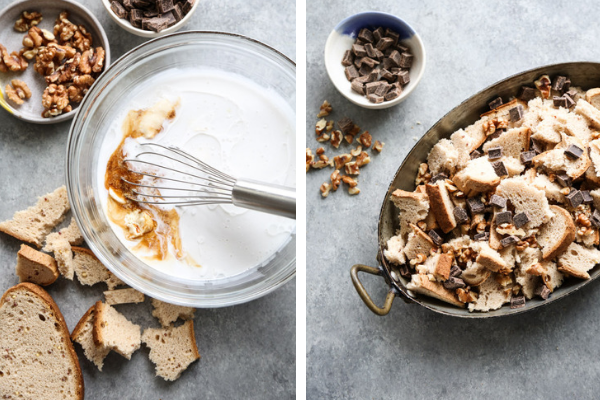 Banana Bread Pudding gets a lighter spin with this dairy-free custard and gluten-free bread. Which just means more room for chocolate. 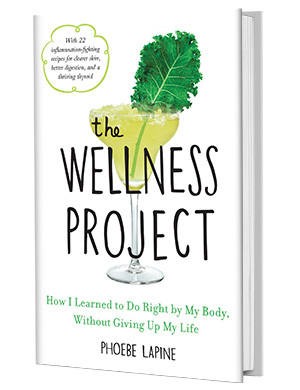 If you're eating plant-based simply swap a flax egg for the egg. Make the custard: in a large bowl, whisk together the coconut milk, eggs, maple syrup, coconut oil or ghee, banana, vanilla, and sea salt until smooth. Grease a 9x13 casserole dish with coconut oil or ghee. Roughly tear apart the Little Northern Bakehouse Wide Loaf Bread into 2-inch pieces and arrange in the pan in an even-ish layer (you should have around 4 cups total. Top with the walnuts or pecans, and chocolate. Pour the custard over the bread, using your hands or a spatula to press down any rogue pieces so they are all more or less submerged. Allow the bread to rest at room temperature for at least an hour so it absorbs the custard, or cover and place in the fridge to sit overnight. When ready to bake the banana bread pudding, preheat the oven to 400 degrees F.
Transfer the casserole dish to the middle of the oven and bake for about 40 minutes, or until puffed and lightly browned on top. 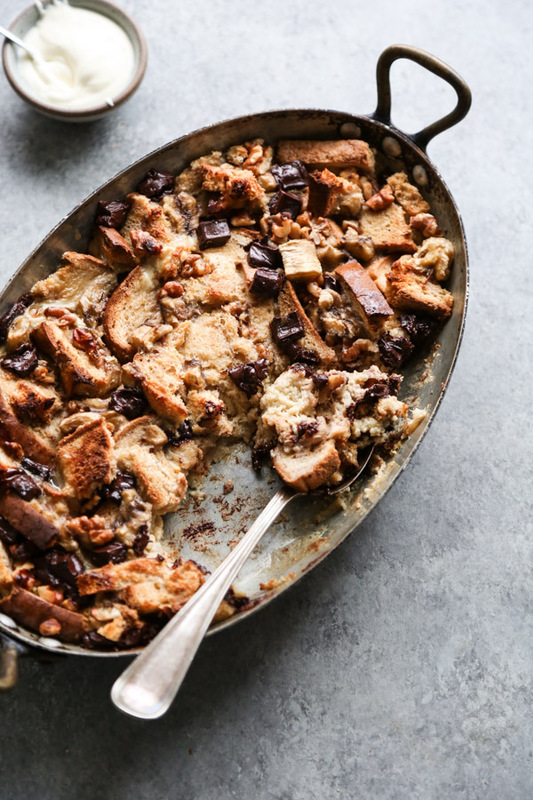 Remove the banana bread pudding from the oven and allow it to rest in the pan for at least 10 minutes before cutting into it. Then serve topped with vegan vanilla ice cream or crème fraiche, if needed.